Also known as: Cuphead in: "Don't Deal With the Devil"
Cuphead is a run 'n gun platformer with an art style reminiscent of the "golden age" of animation. Test levels, more graphics, unused code, and unused sound effects. There is a debug console in the game that can be re-enabled with a patch. This console serves several purposes such as toggling invincibility, boosting the player's damage and accessing the level select among other things. Place the files into the same folder as the game executable and then press F5 while on the map or in a level to open it. A fully functional level select can be accessed from the debug console with the command scene.select. 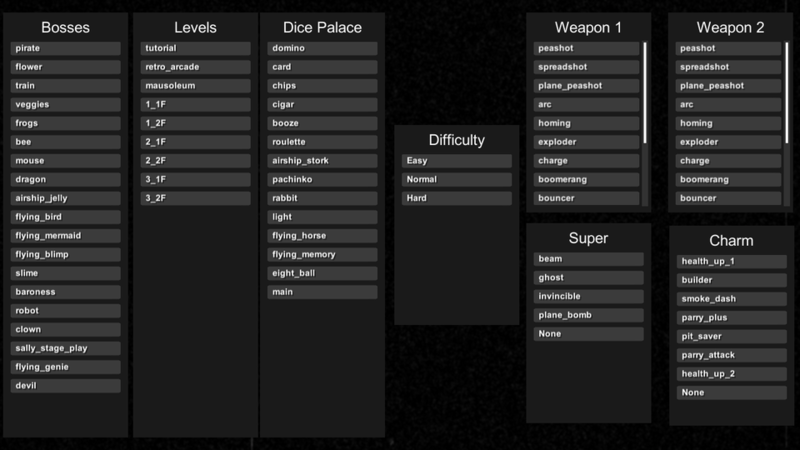 Difficulty, Weapons, Super, and Charm can be changed at will until a level is chosen. Clicking on a level will load it after a few moments. As of the v1.1.4 update, clicking on airship_jely, retro_arcade, airship_stork, pachinko, or light will softlock the game due to their assets having been removed. There might be more unused files in other sharedassets files. Unused sounds for Cuphead and Mugman's intro animations. In-game, they're silent. Leftover sounds from the 2015 demo. Possibly the Bomb special in airplane sections laughed before exploding. Was most likely intended for the unused Triple Laser/Wideshot weapon, which uses the Peashooter's sounds instead. 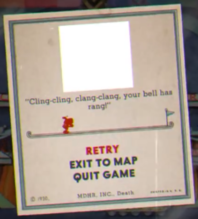 Cagney Carnation originally had sounds for being defeated in his 2nd phase, but he's silent in-game. Strangely enough, it plays when he's defeated in early demos. 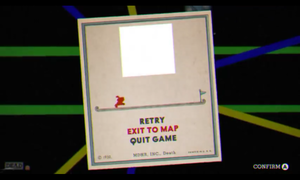 Possibly planned for when Cagney is defeated in Simple mode. It doesn't play in the demos, with the 2nd phase death sound used instead. A completely unique theme can be found under the name of bgm_title_theme.fsb in the files. 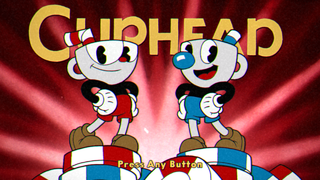 It's a faster, more upbeat rendition, and the last "Cuphead" towards the end sounds identical to the fanfare that plays on the overworld once you beat a level. It seems to have been made early on, as it references events that don't happen in the final game. Cuphead. Entered a tournament to buy him time. And this was how the adventure was born! This file contains the opening song in reverse and lower-pitched with the laugh of King Dice starting at the 0:29 and ending at 0:39. When viewed as a spectrogram, this song contains imagery of the Devil from 0:40 to 0:58. These images are all taken from the fight in his first phase, his transition phase, and his second phase. This page or section has one or more broken YouTube links. Please find an archived version of a video or a suitable replacement. Note: All of these names are merely guesses based on the filenames. Specifically: Describe these bosses a little more in-depth. "Cling-clang, clang-clang, your bell has rang!" A boss named "Pachi-Pachi", labeled and designed as a Pachinko machine, can be selected in the game's debug menu. The boss' only attack is a non-animated flame that comes out of its head. Throughout the fight, blue/black colored balls fall; though not colored the same way as other parryable objects, the black balls can be parried. This boss has a death quote, but the boss picture is missing. Also found in the debug menu is a boss called "Light". The boss is basically a crudely drawn thing and has no attacks. When the battle begins, cutouts of Jared Moldenhauer's head fly in a straight angle. It also lacks a death quote. This boss was apparently cut early, as all of the assets are crudely-drawn placeholders, and it lacks a hitbox for the player to damage them. The fight uses a falling block matching-game gimmick: blocks would fall down in a grid, above where the player is standing. If unmatched pieces drop onto the highest point of the grid, a spiked platform above the player would lower to allow the next set to land on the highest piece, no more or less than a single space will always be available.The platform could be raised, either by matching 3 or more pieces horizontally or vertically to lower the highest piece, or clear all the blocks, if the highest piece exceeds the grid's set maximum size. This test level uses a pixel-art grass platform, and features cutouts of developer Jared Moldenhauer's head flying in from left and right. There is also a white platform at the bottom of the room. The quote used upon death, "You are not a warrior, you're a beginner" is a reference to Street Fighter II, where it is Sagat's victory quote. The same message is shown if you somehow die on the tutorial, such as by using the unused Ranger weapon. An addition to The Root Pack, he will spawn when Mr. Weepy is killed. He only attacks by spinning in an attempt to hit Cuphead. When he dies, he explodes into pieces. This shows a early version of the level Dramatic Fanatic. In this version of the level, the transition to phase 2 is different; instead of Sally riding with her husband, the husband dies by the chandelier. With it being unfinished, the second phase shows us at a nunnery instead of a nursery in the final game, and instead of babies throwing bottles, it's replaced by nuns throwing something; also the pope is there instead of the husband in the bushes. In the third phase, the husband comes back, but this time in his god from; he would throw berries at the player. There are four weapons and one charm that are unused in the game. These unused items can be used using the level select. May have some names mixed up. Please fix if it isn't correct, and improve information. This weapon flies in an arc, sticks to the ground upon impact, grows after a short moment, and explodes when any enemy touches it. This weapon has 3 different damage values, dealing the most if it explodes midair, lowest when it first lands, and a medium amount after it has grown while on the ground. The EX attack fires a quick shot in a downward arc, sticks to the first surface it touches, and explodes after a few moments. It uses the placeholder EX move sound from earlier builds and the art assets that are used for the chaser. This weapon appears in early videos of the game with somewhat finished assets, though the assets got removed in the final version of the game, so a simple filled circle acts a placeholder instead. Though sometimes referred to as "Exploder" in the files, "Ranger" fits better since the weapon's damage increases depending on how far it travels. The EX attack will fire a fast-moving projectile in a straight line until it has hit something, which causes it to launch another shot backwards toward the player, damaging the player if it manages to hit them. This weapon is similar to the spreadshot weapon in the game, but can be more focused in a certain direction if the player uses the aim button while shooting. This weapon is the only one that can pass through objects to hit an enemy, though compared to all the other weapons in the game it's one of the weakest ones. This weapon was cut before an EX was programmed. This weapon is exclusive to the plane fights, similar to the first weapon in the game, when using a card, multiple shoot out in a circular angle similar to the earlier builts of the default shooter's EX. This weapon is somewhat weak, but it can build up EX cards quickly. This charm prevents damage from pits, and increases invincibility frames. Most likely removed due to being overpowered. Interestingly, this charm got nerfed in the v1.1.3 update.